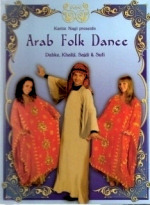 This inclusive program introduces 4 folk dance styles from around the Arab world: Dabke, Khaliji, Saidi & Sufi. Karim teaches the steps, gestures, and combinations with detailed explanation and educated structure. Each step has an Arabic name and a cultural context, and all are clearly explained and demonstrated. Accompanied by Aubre and Lauren, Karim presents all the lessons, plus 6 choreographies that can be performed by any size group. Running time is 83 minutes.